Check your Amazon emails if you are a Kindle ebook reader! You may have received an email that offers you a $3 store credit that can be used towards 28 specific ebook titles. The majority of these ebooks are $3.99 or $4.99, so you’d be getting one of them for 99c or $1.99, or free if you are “slow shipping credits” in your account. To encourage people to buy more of these books, Amazon is offering a 25% Promo Credit on the purchase of these books. 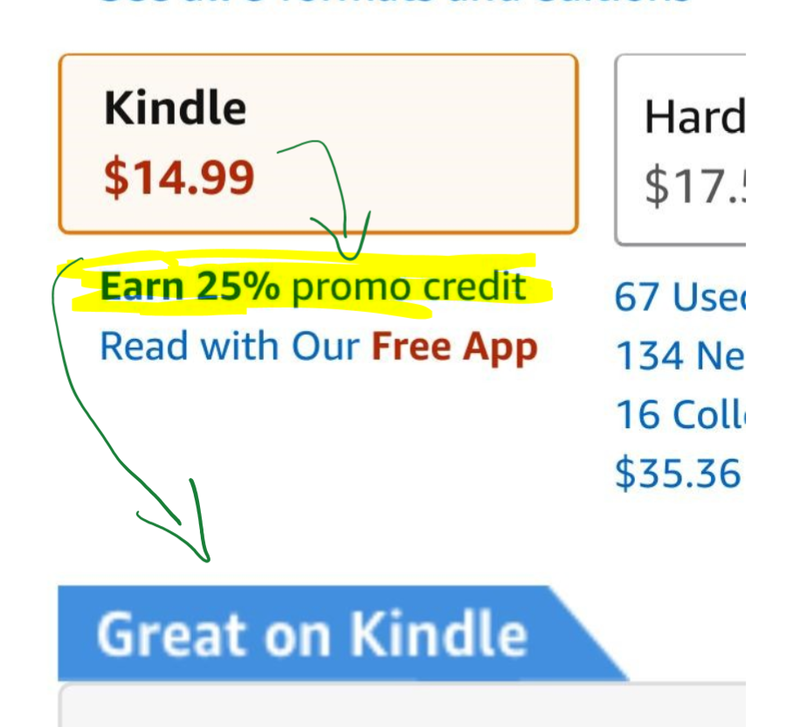 So for example if you buy a $10 eligible Kindle ebook, you will receive a $2.50 promo credit to use towards future purchases of eligible Kindle ebooks. It’s not just free, it’s DRM-free! You have until March 23 in 2018 to claim your free copy of the science fiction book “Too Like the Lightning” by Ada Palmer from the TOR ebook club. 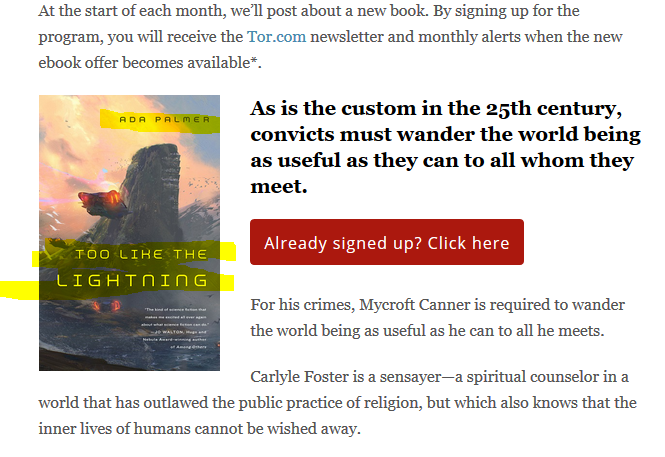 Tor is part of the MacMillan Borg (okay, group) of publishing. All you have to do is give them your email address. Then you can download the ebook in either (or both) MOBI and ePUB. The formats are DRM-free. You can email them or download or sideload them on your device(s) of choice after that. If you are part of the Google Play ecosystem (you don’t need an Android or Chrome device; you can also use your computer’s web browser), check your account by surfing around the Google Play store, or checking the Notifications section of the Play Store, they are right below the place that shows you which apps need updating. Kindle First choices for March 2018 are here! Kindle First, now reborn as “Amazon First Reads” because the hardcovers come out before the ebooks for the general population, is back with another month of choices for Prime members. As before, six pre-release ebooks are available for Prime readers to select from. You get one for free and read it right away, while the rest of the universe waits for it until the beginning of the following month. Don’t sleep on this offer because it expires on Friday February 2nd at 12pm eastern time! 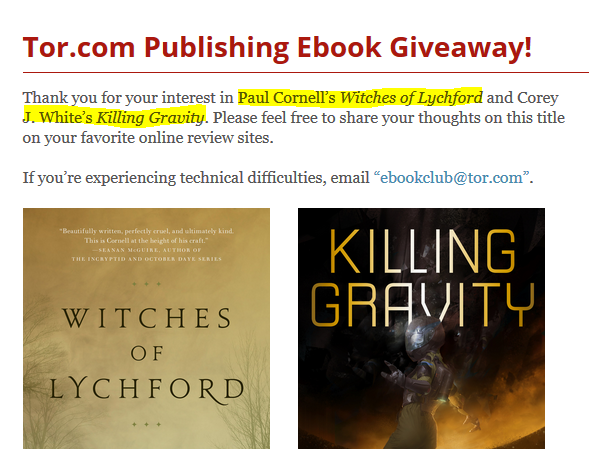 All you have to do is sign-up for the TOR (publisher of speculative fiction) emails, and you will receive TWO DRM-free ebooks in Mobi and ePUB formats! That’s right, two freebies! If you are already signed up for their emails, look for their email with the details! Kindle First choices for February 2018 are here! February is here, and long before you celebrate Valentine’s or Chinese New Year, there’s a new round of Kindle First. Or as Amazon likes to call it now, “Amazon First Reads” because they changed how the program works. More specifically, they added to the program. The old way still continues, Prime members pick one out of six pre-release e-books for FREE and can start reading it right away. The addition is that you can also buy one of those books as …hardcover prints. Kindle First choices for January 2018 are here! But as Prime members, we still get one of the six for FREE. The hardcovers are NOT free 🙂 As usual, you have until the end of the month to make a pick, so you can give them a few more days, so more customer reviews will get published. These can help you which decide book to pick, or which book(s) to avoid picking. It’s a new month, it’s December 2017, and one of the many things a new month brings is a new installment of the Kindle First program, a benefit for Prime members that allows them to pick one “kinda pre-release” e-book from a choice of six, and read it right away. All these six e-books will be officially released January 1st in 2018 for everyone. Non-Prime members can purchase one of the six for $2. Kindle First November 2017 options are up! Another month has arrived, and with it we have six more previously unreleased e-book choices for Prime members as part of the Kindle First program. As usual, you can pick one of the six for FREE and start reading it right now. The rest of the ebooks you can buy starting December 1st. Most of them will end up in Kindle Unlimited. If you love reading the millions of e-books now found in the Kindle Unlimited (KU) program, Amazon is running a sale on prepaid subscriptions as part of their 10-year anniversary. A two year prepaid KU subscription drops to $144 in the shopping cart. There’s no coupon to enter, it just magically drops from $240 to $144 in the shopping cart (40% off). This comes out to $6 per month when you do the math ($144 divided by 24). The regular month-to-month price for Kindle Unlimited it $10 per month. As expected, the 1-year prepaid plan has a smaller discount, it is 33% off, so the $120 one-time annual fee drops to $80, which averages to $6.67 per month. These prices are only for this prepaid subscription term. Renewals will be at the regular prices. If you like beer and e-books [ha! ], then you may be interested in this! For a limited time, the Kindle e-book for “The Beer Bible: The Essential Beer Lover’s Guide” by Jeff Alworth is on sale for just $0.99 for the Kindle at Amazon! That’s 656 pages for this August 2015 publication, so you are getting over 6.5 pages per penny. That’s pretty good in terms of “grocery value” 🙂 Of course books are not sold by the word, but this averages a very respectable 4.7 out of 5 based on 150 customer reviews. It also has hardcover and softcover versions which obviously go for a lot more. This is not a daily deal, so the expiration time and date for it is unknown to me. Grab your e-readers! Starting Monday October 23 in 2017, Amazon will be celebrating (okay, sale-a-brating) the Kindle 10 Year Anniversary with a variety of sales. 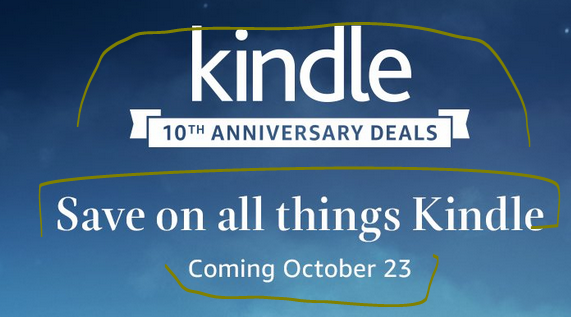 The teaser on the page right now says “Save on All Things Kindle”, so I’m guessing it’s gonna e-books and e-readers and accessories and such.